Academies, societies and other learned fraternities were not only the decisive agencies in the accumulation of knowledge in the early Modern Age, they also committed themselves to a broad range of culture-political aims that frequently shaded off into direct political action taking highly efficient advantage of the latitude available to what were usually rather loosely organised groupings. Making membership conditional solely upon expertise in a particular field and allegiance to interconfessional moral authority, the academies were highly instrumental in furthering the modernisation process in the early Modern Age. With their symbolic forms of interaction they rehearsed quasi-democratic models which stand in direct lineage to the programmatic demands and political upheavals triggering the rise of the bourgeoisie in the late 18th century. The volume consists largely of papers held at an international congress organised in Paris in 1989 under the patronage of Jacques Chirac and forming part of the two-hundred-year celebrations commemorating the French Revolution. 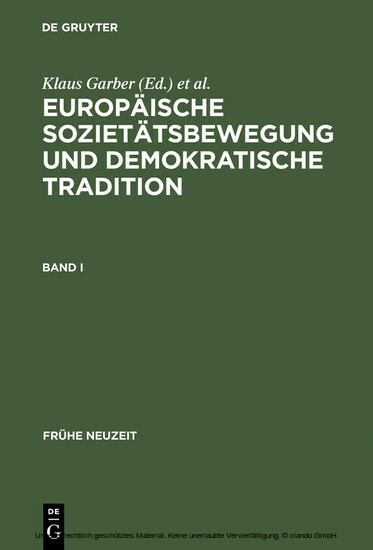 They are supplemented by additional studies designed to consolidate the volume's aspiration to the status of a manual of the European academic society movement, albeit without claiming completeness in the discussion of all the relevant institutions. Copious references, a comprehensive bibliographic survey and a detailed index help to make this an invaluable source of information on a paramount agency of scholarly socialisation of major interest for all disciplines taking a historical view on cultural studies.